How Does Alcohol Affect Blood pH? PH is a term used to describe the relative acid content of blood and other fluids called solutions. In your bloodstream, pH is determined in part by the presence of a substance called phosphate. When you drink alcohol, it triggers changes in your phosphate levels that lead to increases in your blood pH. Human blood is a solution, which means that it has components with a uniform distribution inside a liquid. The pH scale, which ranges from 0 to 14 pH units, measures the concentration of electrically charged hydrogen atoms, also called hydrogen ions, inside your blood or any other solution. PH readings below 7.0 indicate the presence of an acidic blood environment, while pH readings above 7.0 indicate the presence of an alkaline environment. A pH reading of 7.0 indicates the presence of a neutral blood environment. Normal human blood pH is a slightly alkaline 7.4. Alcohol alters your blood pH by altering your kidneys' ability to maintain your blood levels of electrically charged atoms, or ions, of a mineral called phosphate. Under normal circumstances, your kidneys balance your blood levels of phosphate ions against your levels of several additional types of mineral ions — including sodium, potassium, magnesium and chloride — that affect other aspects of your blood health. Imbalances of any of these substances can significantly degrade the effectiveness of your body's overall metabolism. When you drink a relatively diluted form of alcohol, such as beer, you consume a significant amount of water while simultaneously reducing your kidneys' ability to efficiently get rid of that water, according to the University of Montana. The resulting fluid overload and alteration in phosphate levels triggers a decrease in the acidity of your blood, which means your pH level rises. When you drink more concentrated hard alcohol, you increase your kidneys' ability to eliminate water. In turn, you concentrate your blood levels of phosphate, which also leads to an increase in your blood pH. 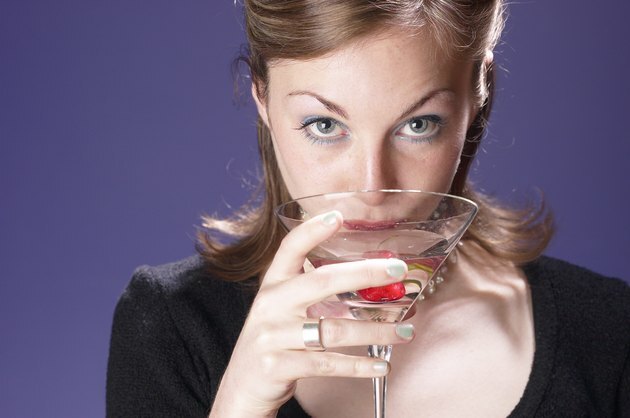 A single drink of alcohol can trigger alterations in your normal kidney function, the University of Montana reports. If previous alcohol consumption has damaged your liver, alcohol's harmful effects on your kidneys will increase. Humans are sensitive to changes in blood pH, and pH levels above 7.8 or below 6.8 can kill you. Under normal circumstances, your body uses phosphate in a system of chemical buffers designed to combat any significant changes in blood pH. However, hard alcohol in particular decreases the effectiveness of the buffer system. Consult your doctor for more information on the kidney- and pH-related effects of alcohol consumption. Can Apple Cider Vinegar Dry Up Your Blood? Can Alcohol Affect Potassium Levels?